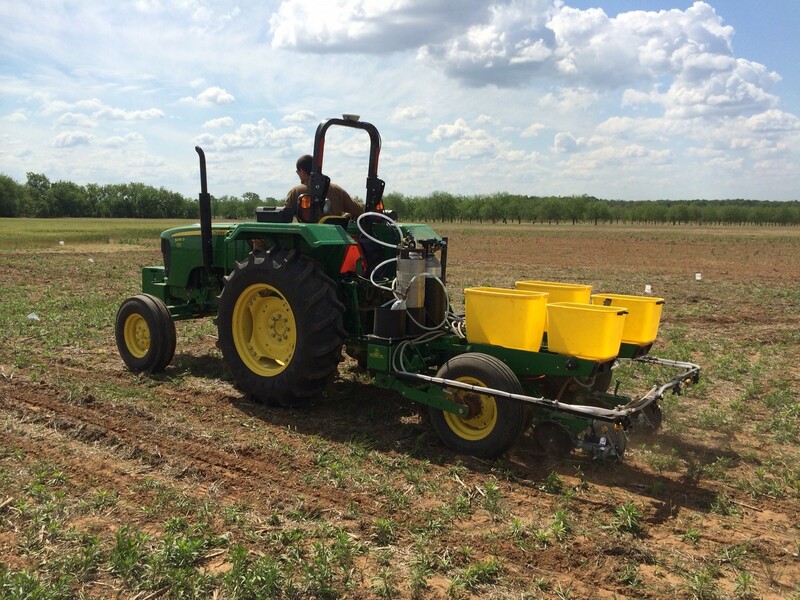 In the spring of 2014 we initiated what was to be the first year of a three year project evaluating starter fertilizers for soybean production in the southern Great Plains. The first and second year was and is being funded by the Oklahoma Soybean Board. Year one was a bit experimental in that with so many products on the market we needed some initial work to help focus the direction for years two and three. I also added a treatment which I knew would have significant negative impact, for extension reasons. Keep in mind two locations in a single year does not make an experiment nor provide enough information to draw a definite conclusion. It is however enough to learn some lessons from and for us to plan for our 2015 trials. The 2014 trial consisted of 12 treatments, Figure 1 and Figure 2. In these treatments I wanted to see the impact of a standard practice, see if a specific nutrient may be more so beneficial, and evaluate a few popular products. The spring of 2014 started out dry so at one of our two locations we pre-watered. This was done by hauling water to the Lake Carl Blackwell (LCB) 1000 gallons at a time and pumping through sprinklers. The other site, Perkins, we delayed planting until we had moisture. Treatment Structure and rates for the 1st year of the Soybean Starter Study. List of fertilizers and products used. Image taken while planting the Soybean Starter study at Perkins. 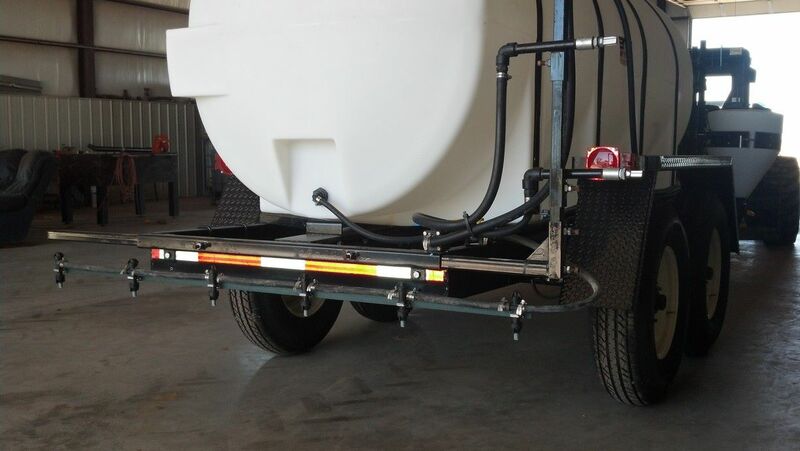 A CO2 system was used to deliver starter fertilizers with seed. The two locations were also selected due to differences in soil fertility. The LCB site is has good soil fertility, with exception of phosphorus (P), and the Perkins site pH was an issue. I would have expected a benefit from adding P at both of these locations. Figure 4 shows the soil test results. Soil Test results from LCB and Perkins. 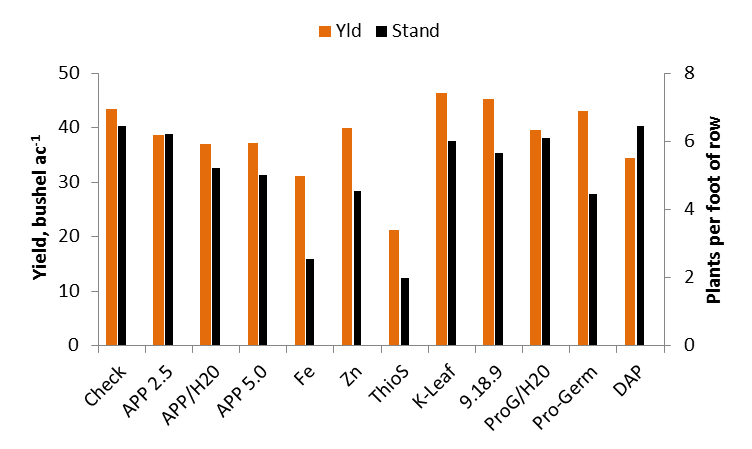 At LCB as expected some of the treatments (Thio-Sul) reduced stand, some unexpectedly reduced stand (Fe) and others had less impact on stand (APP 5.0) than expected. The growth at LCB was tremendous, the 30 in rows covered over very quickly and the majority of the treatments hit me waist high by early August (I am 6’0”). Many of the treatments showed greater growth than check. But when it comes down to it, grain pays and green does not. Statistically there were no treatments that out preformed the un-treated check, however the K-Leaf and 9-18-9 did make 3 and 2 bpa more than the check respectively. What I am hypothesizing at this site is that the added nutrients, especially those with high P levels, significantly increased vegetative grown and these big plants were delayed into going reproductive and they started setting pods later in much hotter weather. While riding in the combine I could see that the plots with compact plants with clearly defined rows out yielded those were the vines had crossed over and we harvested through more of a solid mat of mature plants. A hot August is not uncommon and I am curious on whether this trend repeats itself. If it does this may direct us into research evaluating ways to force/promote the reproductive stage to start in these big plants. Even if we can force flowering to start earlier, it’s unknown whether yields will increase or not. Yield and Stand counts from the 2014 LCB Soybean Starter Study. The Check plot at LCB were plants noticeably a bit smaller and more yellow than the neighbors with phosphorus. 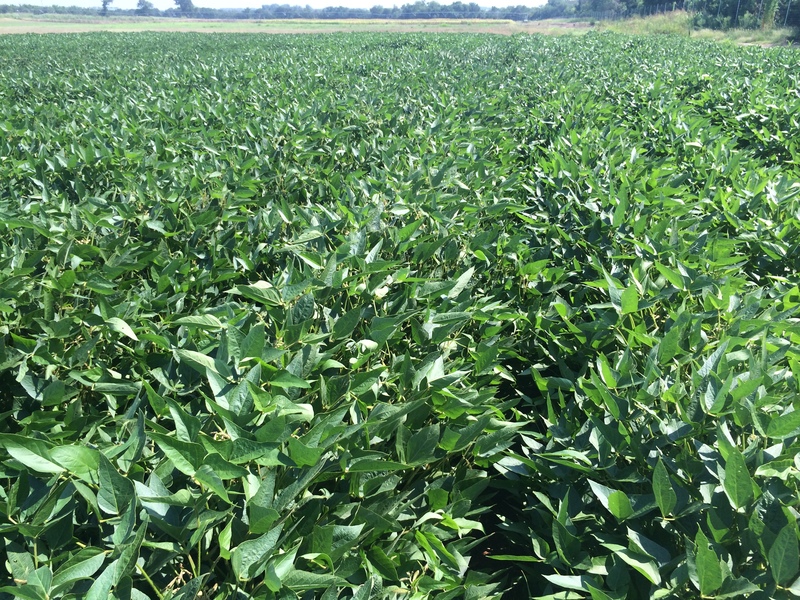 Soybeans at LCB on August 4th. The same trends in treatments reducing stand can be seen at Perkins, however the impact was less extreme. Perkins being planted later due to waiting on moisture forced a later flowering date and I believe reduced overall yields. But the addition of P at this low pH site definitely made a difference. 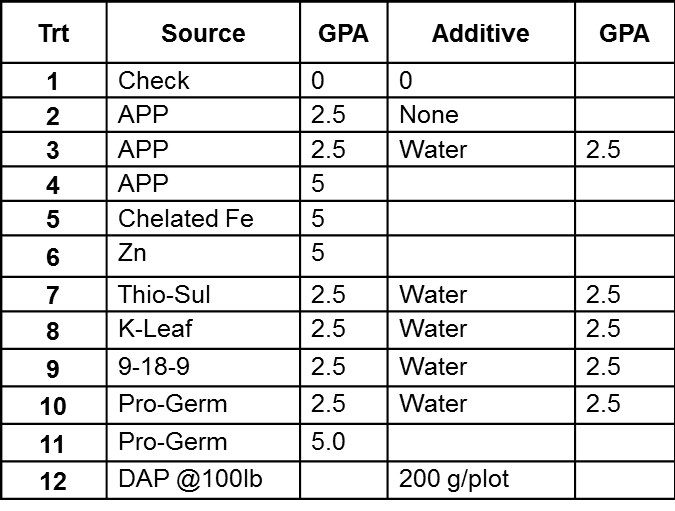 While again no treatments were statistically greater than the un-treated check the 2.5 gpa APP, DAP broadcast, APP/H2O, and Pro-Germ/H20 treatments increased yield by 5.6, 4.2, 3.8 and 1.7 bpa respectively. 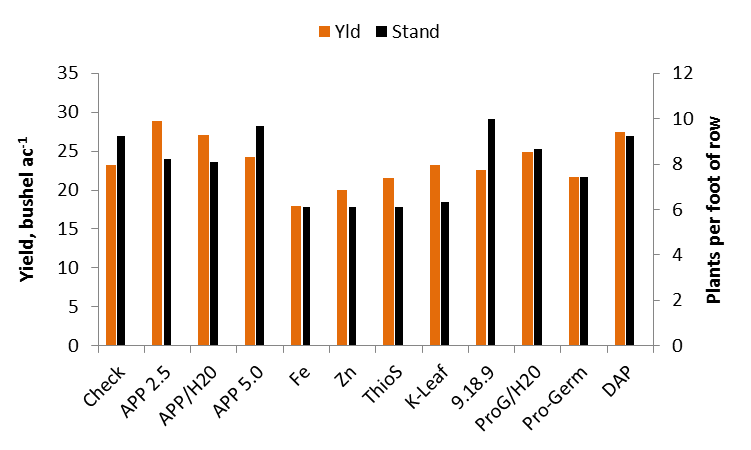 Yield and Stand Counts from the Perkins 2014 Soybean Starter Study. With the significant swing in temperature over the last few weeks many are chomping at the bit to get outside. The wheat is starting to respond to the good weather and N-Rich Strips are showing up around the state. Over the past week I have had several calls concerning the impact of the cold weather on the N-Rich Strips. Many of the fields either are still small due to limited days of warm weather and growth or may have a good deal of damage to the foliage. 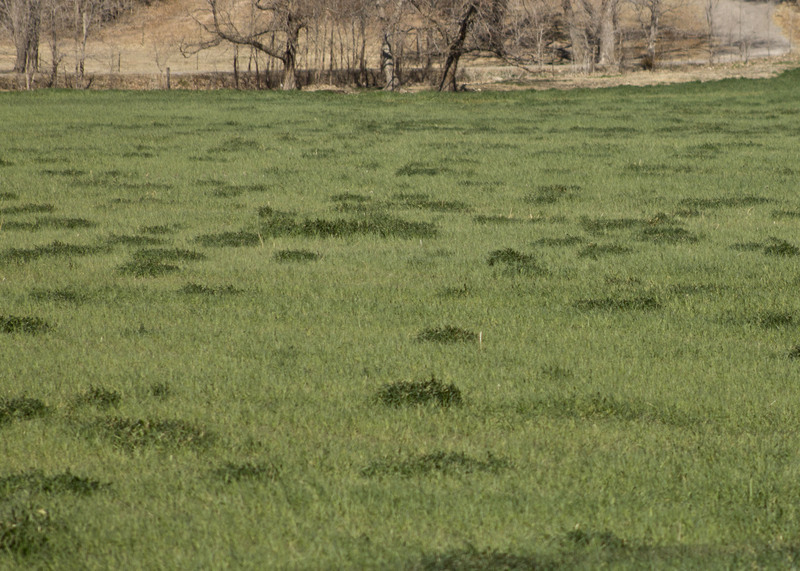 If the field of concern has only a little or no damage and the strip is visible, the time to go is NOW, but if you cannot see the strip and your field has tissue damage or is small, similar to the first two images, then you will need to wait a week or two for sensor based recommendations. Another situation fits with the third image, the field has freeze damage but the N-Rich Strip is also visible. In this case the predicted yield level would be reduced do to the dead tissue making the N rate recommendation a little off. 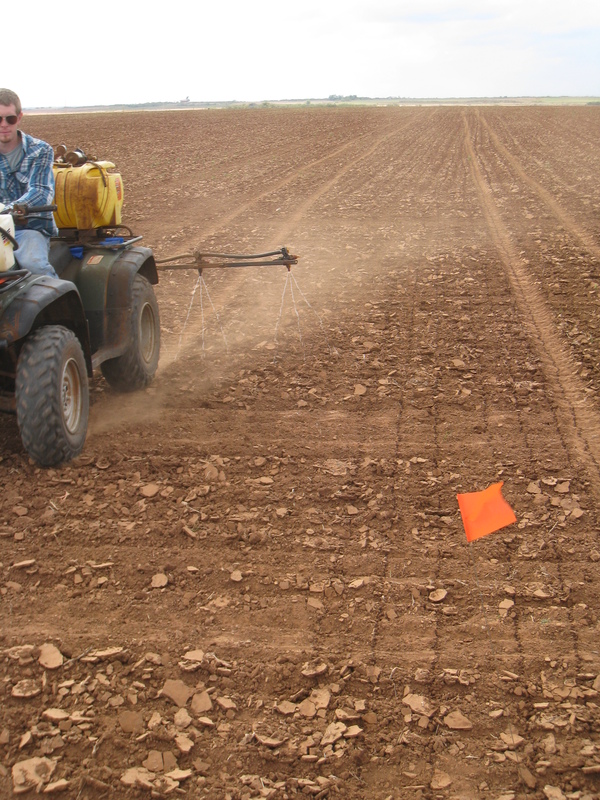 I still however recommend using the sensor and online SBNRC (http://www.soiltesting.okstate.edu/SBNRC/SBNRC.php) to make or base top-dress N rate. Even if the recommendation is a little off it will still be much more accurate than just guessing. However you must look at the SBNRC and ensure that it makes agronomic sense, if it does not consult your county educator or myself. This is discussed in more detail in my earlier blog about freeze damage. Keep in mind no matter what, if you can see the N-Rich Strip, everything outside of the strip is suffering from nitrogen deficiency. Decisions and fertilizer applications need to be made soon, to maximize yield. Winter Wheat and Nitrogen Rich Strips. Regardless of whether or not the strip is visible you should be planning to sense with the GreenSeeker Handheld very soon. Remember the sensor has the ability to detect differences before your eyes can. To sense the N-Rich Strip and Farmer Practice the user should carry the sensor approximately 30 to 40 inches above the crop canopy while holding the sensor level over the crop. While you are walking the two area the trigger should be held the entire time. I recommend walking at minimum 100 paces for each. The average NDVI value seen on the screen will only stay on the screen for a few seconds. Therefore it is critical you have a method of recording the number for later use. The sensor has limited memory so it will time out is the trigger is held for an extended period of time. If you wish to collect more NDVI readings just do it in multiple trigger pulls recording each. Once you have the average NDVI for the N-Rich Strip and Farmer Practice you can go to the SBNRC site mentioned above to retrieve the N rate recommendation. Once in the calculator, for those in Oklahoma, choose the “within Oklahoma” option in the bottom left hand corner of the screen. This will allow the calculator to access the Oklahoma Mesonet to determine growing degree days. After the location is picked from the options you will need to enter Planting Date and Date Prior to Sensing. Additional information requested is the expected grain and fertilizer prices. While these inputs will provide some economic evaluations they will not impact recommended N rate. Below is a YouTube video in which I describe how to use the GreenSeeker to collect NDVI readings, describe the data needed to complete the online calculator, and how to interrupt the calculators output. From the fall of 2011 to about a week ago one of my grad students, Lance Shepherd, has spent A LOT of time burning up the highways and back roads of Oklahoma. 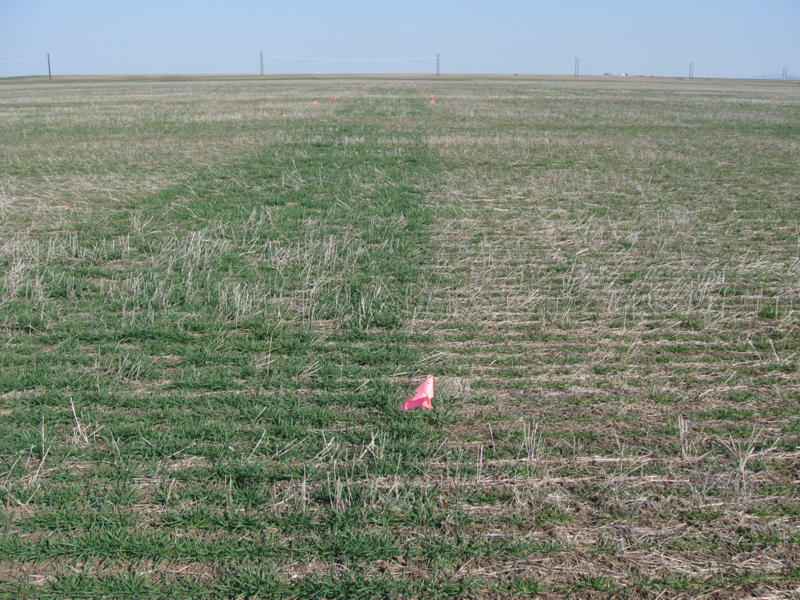 Lance’s project was titled “NPKS Strips in Oklahoma winter wheat”, basically an extension of the N-Rich Strip concept. 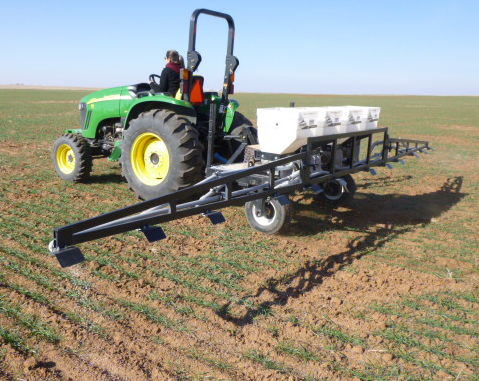 We wanted to see if we could or would find a response to added nitrogen (N), phosphorus (P), potassium (K), or sulfur (S) fertilizer on top of the farmer’s fertilizer applications. 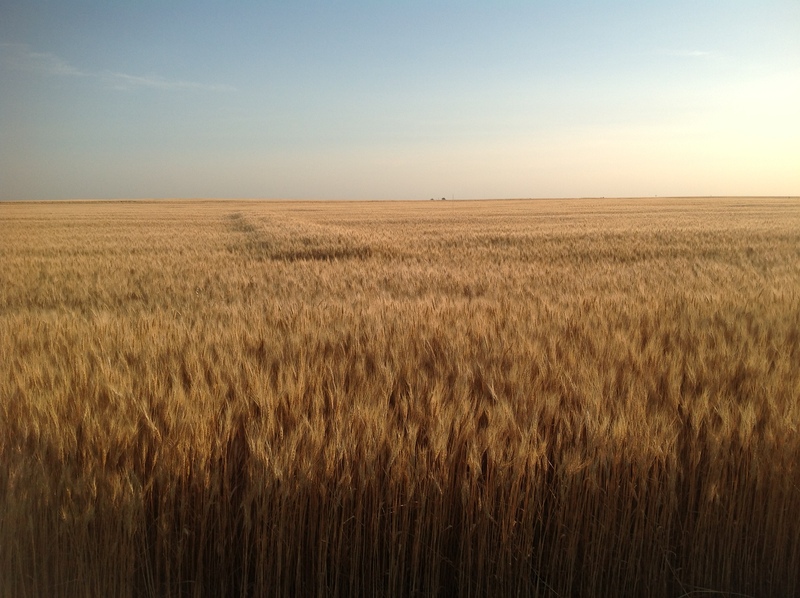 Over the two crop years lance applied NPKS strip on more than 80 fields from the Kansas border to the Red River. Of those 80+ Lance was able to collect, by hand, grain samples from 59 sites. Over the next few weeks I will be sharing some of the juicy tidbits we are gleaming from this fantastic data set. 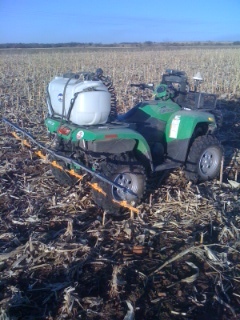 NPKS applicator. Gandy boxes hold each fertilizer and a pto driven fan blew the fertilizer down the boom. For the project at every site Lance collected soil samples to 18”, documented soil type and collected producer fertilizer, variety, and field history information. Over the 59 locations there were essentially 236 trials. The yield of each strip (N,P,K, and S) was compared back to a sample collected from the field, referred to as Farmer Practice. Of the 236 comparisons there were a total of 17 positive responses. Of these 17 responses seven were to N, seven to P, three to K, with no responses to S.
N-Rich strip very evident in field west of Alva. N-Rich 70 bu/ac Farmer Practice 38 bu/ac. We are learning a great deal from these 17 locations. The biggest take home was that in most instances soil test results identified the yield limiting factors. For example of the seven responsive P locations six had either a low soil pH or low soil P index, some both. At only one site was there a response not predicted by soil test. Of all 59 harvested fields more than just six had low P or pH levels however most producers had applied enough fertilizer to reach maximum yield. For nitrogen two items proved to be the most likely reason for loss of yield, under estimated yield goal or environment conducive to N loss. As for the K responses we look at both K and chloride (Cl) as KCl, 0-0-62 potash, was applied in the K strip. Just looking at the soils data K was not low at any of the three sites. 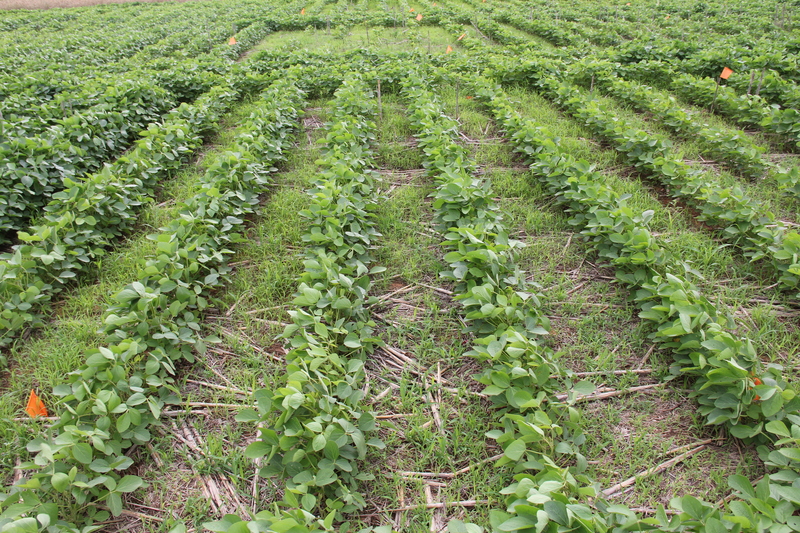 However, two sites are in sandy loam soils, which is conducive to Cl deficiencies. The lack of response to S was not surprising as soil tests indicated S was sufficient at all 80 locations were strips were applied. So again what did we learn from these plots, soil testing is key in maximizing yield and profitability and in most of the N responsive sites the N-Rich strip indicated a need for added fertilizer in February.